Situated in 240 acres of unspoilt Surrey woodland, Whiteley Village is an idyllic home for the 500 or so people living independent lives in Grade II listed cottages. William Whiteley, of Whiteley's Department Stores in Bayswater, died in 1907 leaving a legacy of a million pounds 'To house the elderly poor'. The site for the village was chosen in 1911, with Walter Cave as consulting architect. 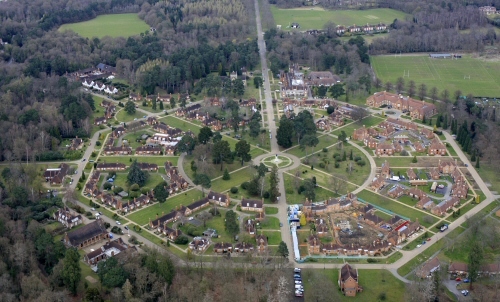 The layout of the village was by Frank Atkinson (architect of Selfridges) 'Garden Suburb' in concept, formal and symmetrical with a monument to Whiteley at the centre. Building took place principally between 1914 to 1921 providing houses by Sir Reginald Blomfied, Sir Mervyn McCartney, Frank Atkinson, Ernest Newton, Sir Aston Webb, Walter Cave and Sir Ernest George with the church of St Mark by Sir Walter Tapper. There are 262 cottages in almshouse style and each with its own garden, two churches, a village hall, shop, post office and library; the villagers enjoy a huge range of clubs and activities. The Society made a visit to the Village in 2001 which was thoroughly enjoyed by our members. The Property Manager made us most welcome and gave an excellent and informative talk about the Village, its history and the proposals for future development. The Village is now undergoing a modernisation that renovates the Arts and Crafts elements and preserves the very best of the architecture whilst providing homes that meet the needs and aspirations of current and future residents. The major drawback for the Trust being that, as a result of the architectural considerations (such as non-standard bricks, heritage materials, the need for specialist skills and experience) the cost of the project is dramatically higher than would have been modernisation of more standard buildings or, indeed, demolition and replacement of the cottages with new buildings. The cost is almost double what would otherwise have been the case. The trustees wish to preserve architectural gems that give the wonderful look and feel of the Village. The project will cost on the region of �34M of which nearly three-quarters has been found and either spent or committed. To date, nearly half of the project is complete and more than another quarter underway. It is one of the largest ever private investments in social housing and the cost is, to a significant extent, being driven by the heritage architectural aspects, so it is worthy of note in both the arts and crafts arena and architectural circles. The Whiteley Village Appeal is still looking for about �6M to finish off the project. Were it not for the heritage aspects, the Trust would have finished the project from its own resources but is now urgently in need of help to finish the last of the work. HRH The Prince of Wales is the patron of the Whiteley Village Appeal and is highly supportive of the essential work being carried out.